So often I see organizational change management as a part of the implementation plan for putting the recommendations and new design of a Business Process Improvement project (BPI) into operation in a company. It should be there, but it needs to start sooo much earlier. In fact it needs to start with the first phase of a BPI project- namely in developing the charter and doing Process Discovery and Modeling. I just participated in a workshop with a colleague, Anna Ewins of Ewins & Winby, on Organizational Change Management. In the models presented here and in her workshop, organization development consultant Anna Ewins draws on the work of psychiatrist Dr. Elisabeth Kubler-Ross who researched how people deal with tragedy, bereavement and grief. Anna Ewins uses Ross’s model with application to organizational life by Dennis Jaffe & Cynthia Scott to illustrate the psychological responses people typically experience in one way or another when faced with change. 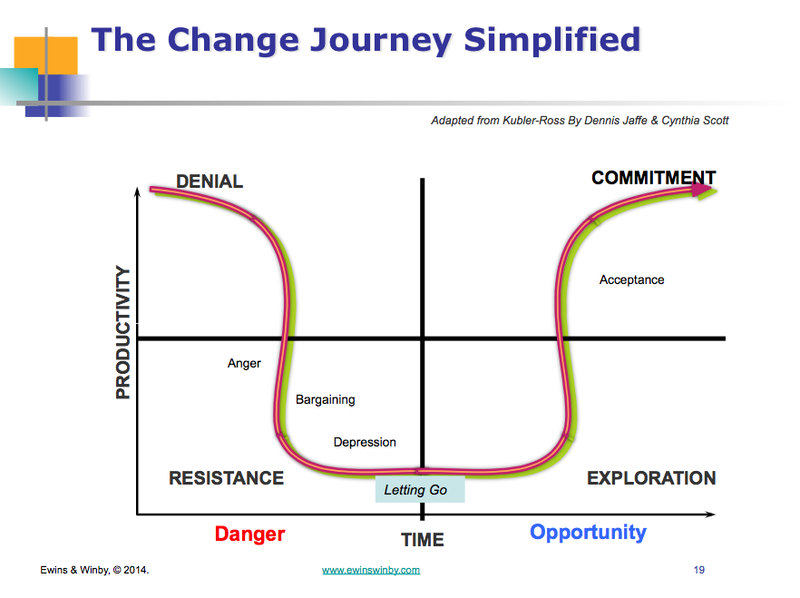 The personal change model developed by Kubler-Ross and simplified by Jaffe & Scott shows that we move through four stages: denial, resistance, exploration and commitment. 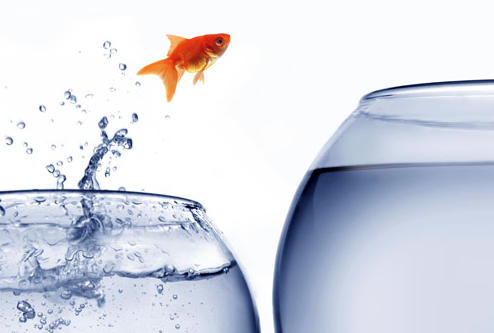 If we perceive the change to be beneficial we are likely to move quickly from the first to the fourth stage. If not, we may be delayed considerably in denial and resistance. Ewins, who currently teaches a course at UC Berkeley Extension on Change Management with her business partner Mary Winby, shows us how we can use this model to both assess where an individual or group is in their personal change journey, and strategies for helping others move through change. On the personal side, think of a change in your life and see how you journeyed through the four stages. One example could be the possibility of the need to change jobs. Your company has been bought out by another company and your job could be eliminated. In denial, you may be saying, “ I don’t think this will impact my job. It is critical to Finance and the other company will need to keep this department for six months to a year to make any transitions.” Then you find out you will be laid off in four weeks. Now you move into resistance. You could be saying, “Why was I so silly? I could have started the job search process several weeks ago.” Or “Maybe I can get another job in the new company and that’s where I could land for awhile.” Or “What do I do now? This is pretty depressing. I don’t know if my skills can transfer to something new.” All of these are examples of the resistance phase. With time, you move into exploration, as you begin to see new possibilities, start talking to friends and employees about ideas they have. Some of their ideas spur you own to explore similar jobs elsewhere or different opportunities in new job domains. The next stage, commitment, can come tentatively at first with your new energy. It can come when you land a new position or feel confident about the path you are exploring. Now as you are getting on with the next stage you see that it has possibilities and moves you in a positive direction. Part 2 of this blog will explore how the Change Management framework works in a business setting, specifically a Business Process Improvement Project.